RÉPENER is a research project co-funded by the Spanish National R&D Plan 2009-2012 which is carried out the research group ARC Enginyeria i Arquitectura La Salle, Barcelona in collaboration with the Faculty of Business and Computer Science, Hochschule Albstadt-Sigmaringen, in Germany. The aim of this research project has been to design and implement a prototype of an energy information system using semantic technologies, following the philosophy of the Linked Open Data initiative. The developed system –SEIS, Semantic Energy Information System– integrates two types of data sources, proprietary and open. The energy model in which the system is based comprises two types of energy: building data (consumptions, provision, installations, use, etc. 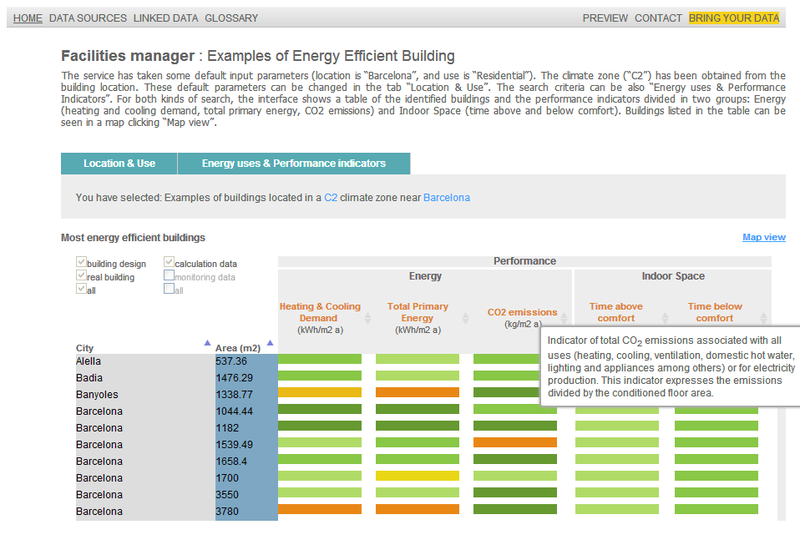 ), and data related with other fields (environmental, social, economic,…) that can have an impact in the buildings’ energy efficiency. SEIS facilitates to various agents (technical teams, consultants, users, energy managers, public) access to energy information created by different applications (energy certificates, simulation, monitoring) throughout the building life cycle, from design to use and operation. SEIS deployed services provide qualified information to improve the decision making process in their respective areas, with the common purpose of improving the energy efficiency of buildings. SEIS interfaces enable users of different profiles – technical equipment, building managers, owners, and consultants interact with the energy-information system in a personalized way. SEIS may be extended in the future with new energy data that can be added to the system of semantic information, and new services tailored to the specific needs expressed by users. In 20 November of 2013, the members of the ARC group have presented at the Col.legi d’Arquitectes de Barcelona the SEIS energy information system, developed in the context of the REPENER project, funded by the Plan Nacional de Investigación 2010-2013. The RÉPENER team is proud to present SEIS, a Semantic Energy Information System which integrates distributed building energy data. In SEIS, users with different profiles – architects and engineers, energy consultants, public administrations in charge of energy certificates stakeholders, building owners and facilities managers – can retrieve and upload data using the services implemented in the system. This first version of SEIS can be enhanced with additional data and services. As part of the activities under the research project RÉPENER, we designed some demonstration scenarios for various experts in energy efficiency in buildings to assess the functionality of a prototype of the SEíS energy information system developed in the project RÉPENER and to enrich it with their contributions. -Advisers’ on energy efficiency in buildings (Luca Volpi, Societat Orgànica). -Project and construction managers (FIDELA Fruits, Fruit-Sanmartin Architects). -Building management of non-residential buildings (Antoni García, Gran Teatre del Liceu). -Public energy agency (Ainhoa Mata, ICAEN). -Public buildings developers (Anna Mestre, Agència de l’Housing of Catalonia). -Building permits management (Miquel Diez Valldoreix EMD). The program of the working session included: presenting the research project RÉPENER and its lines of development; presenting the demonstration scenarios corresponding to some of the most common situations that experts find in their daily practice; explaining the structure, functioning and services provided by the SEíS information system, and finally, a discussion with the participants. 1) Early stage of the design of a project of a new multi-family building. The designer is the primary user of the information system and the information he/she requires are passive design criteria (building systems) and active (engineered systems). 2) Improvement the use and maintenance of a multi-family building. The user of the services of the system is the manager of the building and the information he/she needs are reference values (consumption, temperature, etc..). 3) Refurbishment of a multi-family building, at an early design stage. The main user of the system’s services is the developer interested in finding examples of good practices which can be compared to the building being refurbished. 4) Energy assessment of a new multi-family building at an early stage of the design. The main user is an energy advisor who introduces the results of energy simulations to compare them with the information stored in the system. In the working session, opinions and comments from the experts were collected. After the session, interviews were conducted with each of the participants to assess and validate the functionalities of the prototype system and to draw conclusions that would enable to improve it further. -Other issues related to the research project and recommendations. The responses received from the experts at the workshop and in subsequent interviews, confirmed that the information provided by the various services of SEíS in the four scenarios presented was “important” or “very important”. Also, they recognized the improvement that would represent the access and use of the energy information provided by the SEíS system prototype in their respective areas of work. Furthermore, most of the experts highlighted the need to have data on construction costs and operation to assess the economic impact of energy efficiency measures. – Increasing the number of cases to a greater number of climatic zones, as well as uses and building types. Two papers were presented at the conference SEMAPRO 2012 in Barcelona on 24-27 September. The two papers deal with technological issues developed during the project. Specifically, RÉPENER ontology design and strategies for creating links between different data sources based on the semantic web. information. The presentation took place at the Ramon Llull University in the meeting on “Energy and Sustainability” organized by the Campus of Excellence Aristos Campus Mundus. RÉPENER has been presented in a paper at the ECPPM 2012 conference held 25 to July 27 in Reykjavik, Iceland. A Linked Data in Architecture and Construction Workshop organized by SmartLab, University of Ghent has taken place on 28 and 29 March 2012. This Workshop had the participation of researchers from ARC Enginyeria i Arquitectura La Salle, Lawrence Berkeley National Laboratory, Berkeley, la National University of Ireland, Galway, Ireland, and the Laboratory of Software Technology Aalto University, Helsinki. The theme of the workshop has focused on analyzing the potential of semantic web technologies, the Linked Open Data and ontologies applied in the AEC sector and energy efficiency.